Roger Williams Park Zoo’s Faces of the Rainforest is OPEN. There are many facets to this exhibit, so let’s start by meeting some of the interesting animals. Delightful, amazing, captivating, engaging and VERY LOUD, all describe one of the most endearing species in the new Faces of the Rainforest exhibit — the giant otters. These inquisitive social and noisy animals, Romo (age 6) and Fernando (age 4) are cousins to the North American river and sea otters. When walking through the Faces of the Rainforest, guests will hear interesting vocalizations from Romo and Fernando. This species of otter may have up to nine distinct sounds and possibly more. 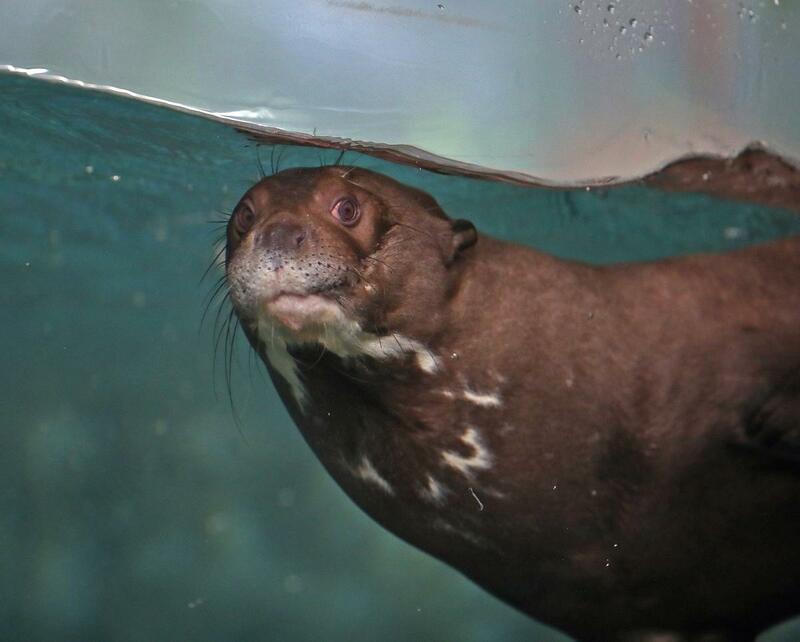 The giant otter can grow to more than 6 feet long and weigh up to 70 pounds, nearly twice as large as the little river otters zoo guests visit in the World of Adaptations. Romo and Fernando are amazing creatures to watch. Like children, they play hard, but need time to recharge before embarking on games on the water slide and in the pool. The two otters have very different personalities. Romo, who is distinct with a large area of white fur under his chin, is very curious. He may even swim up close to the window in his habitat to greet visitors. Fernando is a bit shyer and takes a little longer to warm up. To stay healthy these active critters’ diet consists of a variety of fish including capelin, lake smelt, tilapia and trout fed to them four times a day. Giant otters swim by propelling themselves with their powerful tails and flexing their long bodies. They have webbed feet, water-repellent fur to keep them dry and warm, and nostrils and ears that close in the water. While many of the animals in the new Faces of the Rainforest are in pairs, visitors will see some animal families as well. 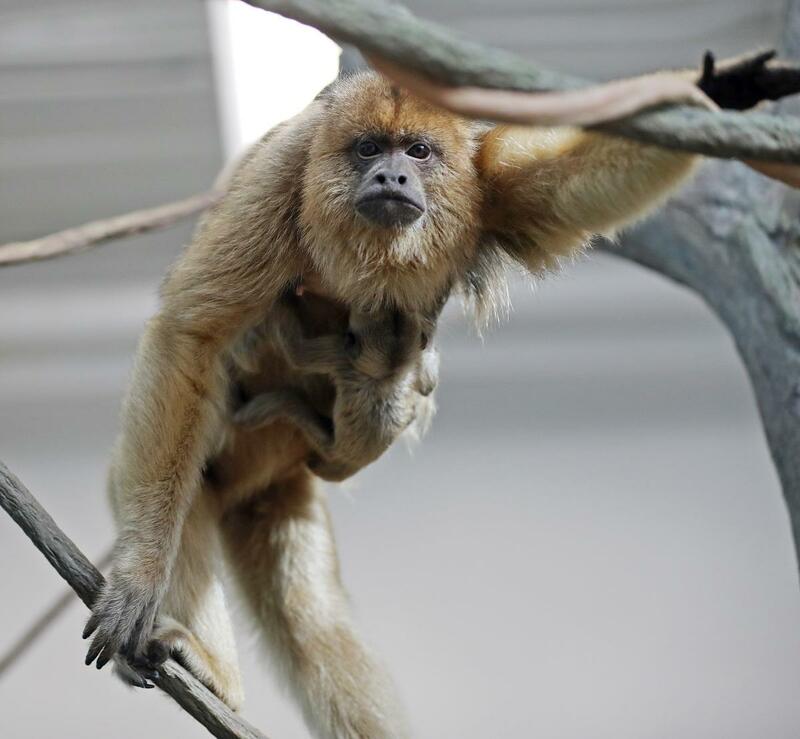 How exciting to have the howler monkeys be the first to give birth to a healthy baby in the new exhibit on Nov. 21. Howler monkeys are indigenous to tropical South and Central America, and are the loudest of all monkeys. They call to let others know where their territory is, alerting them to stay away. The calls sound like a loud whooping bark or roar. Howlers do not generally leave the treetops, and eat mainly leaves, as well as fruits, nuts and flowers. They get almost all the water they need from the food they eat. One of the few times they go on the ground is during very dry spells, when they need to find extra water. Howler monkeys have prehensile tails, or tails that can grip. The monkeys use their tails as a fifth limb to grip branches. Mostly they use their tails to help grip branches as they eat and move around high in the trees. The head and body of adult howler monkeys range from 22 to 36 inches long and their tail can add 23 to 36 inches. Deep in the Sunken Forest of Faces of the Rainforest, visitors will see two Linne’s two-toed sloths. These much-loved animals spend almost all of their lives upside down, even while eating, sleeping, mating and giving birth. Imagine eating upside down! At the zoo sloths enjoy eating primate chow, tofu, strawberries, grapes, blueberries, apples and pears. Sloths live in the rainforests of South and Central America. They move slowly and deliberately, only descending to the ground to change trees or defecate, which happens only once a week since their metabolism is so slow. Food may stay in the sloth’s digestive tract for approximately one month. Sloths are good swimmers because of their streamlined body and fur, perfect for the wet, tropical weather of the rainforest they inhabit. The sloth is covered in long brownish-grey hair that curves from stomach to back, opposite of most mammals. Each strand of the fur has grooves, which collect algae, giving the sloth a greenish tint and camouflaging it from predators. 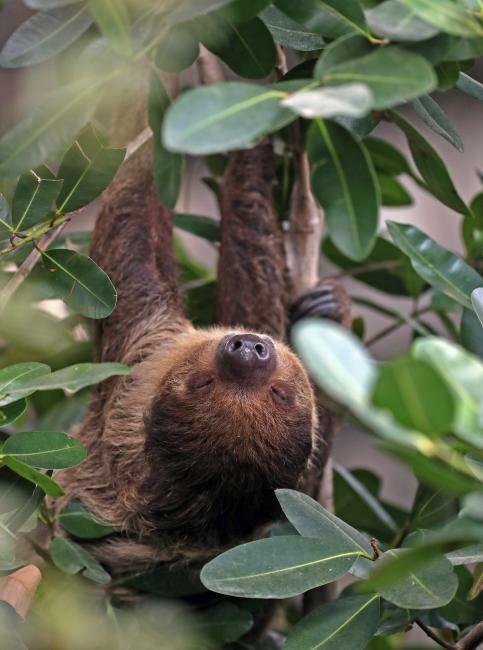 Curling into a ball is a sloth’s most common resting position in the branches of a tree, resembling either a termite nest or a knot in the wood. Additionally, the greenish color of their fur affords great protection from predators. Sloths can defend themselves with their claws and teeth, but they tend to be a docile animal. Their life cycle in the wild is 10–15 years. In a zoo, a sloth may live more than 30 years. Diane Nahabedian, director of marketing and public relations at the Rhode Island Zoological Society/Roger Williams Park Zoo, has more than 30 years of experience in the nonprofit arena. Prior to joining the Roger Williams Park Zoo, she provided marketing and communications expertise to nonprofit organizations, including conception of marketing plans, media and public relations, as well as image and branding revitalization.